Two compartment unit features a safelight at the bottom and a normal incandescent room light at the top. Comes with a 6 foot cord and a 3 prong plug. The Safelight is an 8x10" GBX type filter. Economy model, screws into any existing outlet. 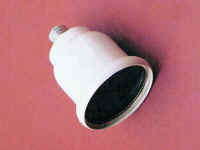 Made of aluminum, filtration is from a GBX type filter that unscrews for bulb replacement. Manufactured of steel and lit by an energy efficient fluorescent bulb. Message on both sides for hanging projected over the door, or against the wall. The unit comes with pigtails for direct wiring. 1/8" thick TrovicelÔ doubled-ced fa tape attached to the back. cat. No. S-10X (size 4x10") "X-RAY ROOM"
cat. No. S-10DE (size 4x10")"DARKROOM"
cat. No. 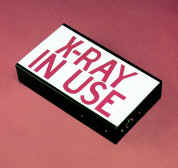 S-10CX (size 4x10") "CAUTION X-RAY IN USE"
cat. No. S-10E (size 8x10")" "PREGNANT" (English, if you are pregnant, or think you may be, tell the x-ray technician before having an x-ray taken"
Stick-on signs available also in Spanish and with custom message.